Create custom New Year cards in easy software with built-in shapes. Do it on your own and make it personalized. DIY your personalized New Year card for your families and friends. We offer over 10,000 built-in shapes and clipart which enable drag-and-drop function. Just unleash your creativity to make creative New Year card of special charm. A personalized New Year card with the receiver's photos and happy moments can send your greetings in the warmest way. The receivers will surely feel your sincere wishes and be touched. Use Edraw greeting card design tools to create invitation cards, thanks-giving cards, Christmas, Valentine's Day and Halloween Cards. you just need to do some simple steps. 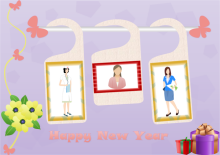 You can design a nice and professional-looking New Year card as long as you can use a computer. Extremely easy. If you are reselling New Year cards, or simply sending a company greeting, don't miss the opportunity to insert your logo on the back of every card. Open Edraw and select Card type. Double click New Year Card icon. Drag and drop shapes from Basic Drawing Shapes library. Open more libraries if necessary. Alternatively, use Pencil or Pen tool to draw any shape you need if you are professional designer. Edit the shapes such as add fill color and type in text. Insert your own logo, photos or pictures. 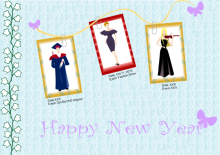 Click here to free download New Year card software. 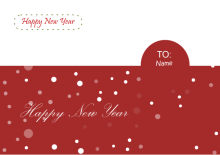 You can use the built-in templates to create your personalized New Year cards in minutes. We offer some readily available New Year card examples. You can get inspiration from our amazing examples. Or you can download them to make them your own. Recolor the shape, add your own contents or insert your photos. Done. Real simple DIY.